The two final teams competing in this year’s Arena Bowl haven’t been determined yet. The final four teams now in the playoffs are actually the last four Arena Bowl champions. The final two teams will be decided this Saturday with the Philadelphia Soul versus the Jacksonville Sharks (7pm) and the Spokane Shock versus the Arizona Rattlers (9:30pm). For those living in and around Orlando, the Arena Bowl itself is actually only the culmination of events beginning on Thursday, August 15th with Media Day at the Rosen Centre from 1pm to 3pm. There will be team photos and interviews along with an appearance from the current AFL Commissioner, Jerry B. Kurtz. The day continues at 6:30pm with the 2013 AFL Celebrity Gala also at the Rosen Center and it promises to be a party with AFL Hall of Famers, former players, and the rock band KISS. The night will begin with a cocktail hour, followed by a three-course meal, live music, and an award ceremony. The long weekend continues on Friday night at 7:30pm with a KISS concert at the Amway Center. If you can’t make it to the game, go for a Superbowl Sunday party in August. 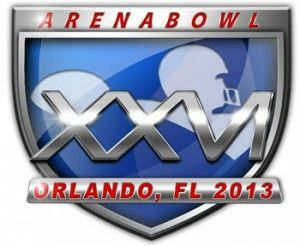 What better excuse to hang with friends, eat too much pizza, and watch a great game than Arena Bowl XXVI!